Justin Kreiner was born in Jacksonville Fl. on 2-19-96. He had to have surgery when he was born because his intestines were twisted. He was 5.9oz and spent his first week in I.C.U. Because of the surgery he was always so small and under weight. That finally changed. Justin has always wanted to race a Go-Kart for as long as I can remember but scared mom felt he was too young and small. We tried to put him in other things like T-Ball but he had no interest in anything but driving a Go-Kart. So on his 8th birthday we bought him a Kid Kart. Feb-June all he did was practice every week until we decided to put him in a race on June 12th 2004. Well my 40 pound little man won his first race. Justin was hooked. We entered him in all the local races and he brought home 10 1st place trophies. 6 months was all he had in the Kid Karts and we had to move him into the Cadet class. In the four years in the Cadet class it has had its ups and downs but for the most part he did very well, and still loves racing. 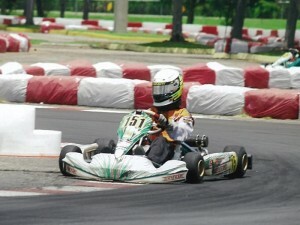 In 2010, Justin is moved into a bigger kart, Yamaha Jr. and Tag Jr.